Big, is the first visual experience of SMOK TFV8 Cloud Beast Tank, and the liquid capacity is also very big, up to 6ml. TFV8 Cloud Beast continues the structure of TFV4 atomizer and it's very easy to operate. Big, is the first visual experience of SMOK TFV8 Cloud Beast Tank, and the liquid capacity is also very big, up to 6ml. TFV8 Cloud Beast is a very good atomizer and its structure continues the TFV4 style, which is very easy to operate. The huge oil guide provides smooth oil guiding for this big smoke atomizer and the wide air inlet provides enough air for large smoke. The most important is that TFV8 Cloud Beast Tank can be adapted to the finished coil and DIY coil, the amount of smoke is super large, and the taste is also very good. TFV8 Cloud Beast Tank is very suitable for beginners to use, you can slowly contact DIY through this atomizer and hope you will have great experience with this thank. • Installing the pre-wrapped coil. Place the coil between the posts and wrap the ends around the screws and tighten up, once all in place make sure the coil is fixed in the center and lined up with the air hole, and also make sure the coil is NOT touching the base. • Positioning and cutting the exceeding ends of wire off. • Cutting a strip of cotton and make sure it's not too much and not too less. • Wet the coil with your e-liquid and adjust the cotton. Warning: Coils must be checked for resistance before they are fired on a device, and re-checked periodically to ensure the resistance remains the same. • Hold the tank and open the top cap. • Add e-liquid through the slot, and pay attention not to drip it into the central airflow. • Close the cap carefully and firmly. Then let it stand for several minutes to get the organic cotton completely saturated. • Quick link: TFV8 RBA-16 coil, TFV8 V8-X4 coil, TFV8 V8-Q4 coil, TFV8 V8-T6 coil, TFV8 V8-T8 coil and TFV8 RBA coil. 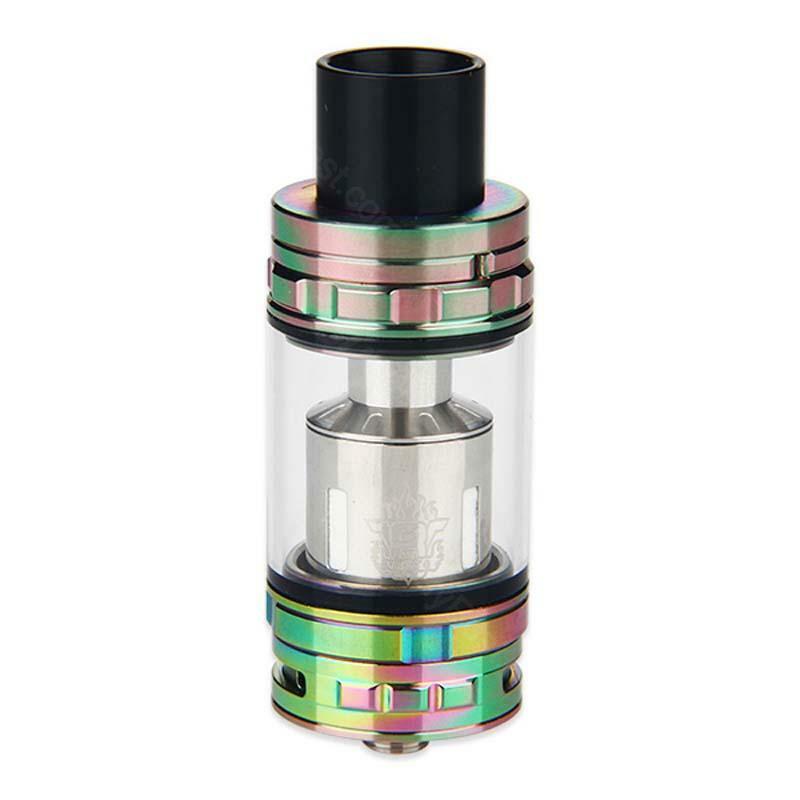 Love the rainbow style & this tank is the perfect size for the alien & the procolor also made by smok! Thanks. SMOK TFV8 Cloud Beast Tank is a 6ml capacity tank for juice with unique patented SMOK Turbo Engines coil structure, adjustable dual bottom airflow, signature hinged top-fill system, and heat-spoofing Delrin ultra-wide drip tip.